The last time they were at the Armory, it wasn't quite the ending Neumann Goretti was shooting for. In an intense Millrose Games battle in early February for the 4x800-meter relay title, where the lead exchanged hands a number of times, the squad from South Philadelphia placed third. On Saturday night back at the Armory, the Neumann Goretti girls were looking for a lot more. 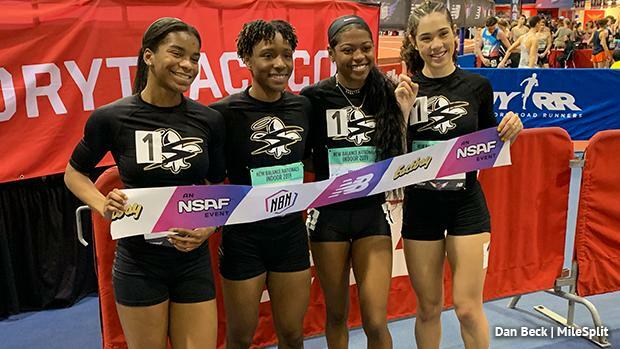 They got it in a big way, leaving little doubt and running away with the national title and setting a new Pennsylvania state record in the process. The Saints ran 9:02.17, over six seconds ahead of second place in a race they controlled from the gun. It is also over a second faster than North Penn's previous state record time (9:03.35) set two years ago at this meet. Millrose was certainly on their minds, though, in their return to the Armory for nationals. "This was our revenge race," anchor Kami Joi Hickson said. "We knew we left something out there at Millrose and we knew we could give a little more effort." "That race at Millrose really set us up for this race because we went back to the lab and worked hard and fix some things," Sanaiya Watts, who supplied the third leg, added. Perhaps no runner epitomized that revenge narrative more than leadoff leg Mykala Perry. The 200/400 specialist ran first at Millrose and went out very hard, but eventually split a 2:20 and handing off in fifth place. "She was so excited and went out in 60-point," Neumann Goretti coach Lincoln Townsend said. "She was hesitant to run leadoff leg at nationals, but I told her 'all you need to do is not go out so hard.'" Perry listened to her coach on Saturday night. She initially went to the front and then got into second position. The junior split about 68 seconds through 400 meters, sitting on the shoulder of pre-race US#1 Thomas Worthington (OH). She made it to the first exchange in second, where she gave the baton to second leg Dasia Wilson. Perry split a 2:16. "Four seconds really made a difference," Townsend said. Wilson quickly made up the small gap between her and Worthington's second runner. She wasted no time going to the front and opening up a gap on the field. By the next exchange, Wilson had given her team a three second advantage on the field after a 2:16 split. "That was my main goal, just to get the gap as big as possible and give my teammates a lead so they could do their thing," Wilson said. Townsend sees a direct correlation between how Wilson is in the weight room and her performance on the track. "Dasia is probably the most physically intimidating athlete I've ever had in the weight room," he said. "Her aggression on the weights really pays off in meets like this. She knows she is strong enough to hold on and she does." Next up was Watts. With a nice lead courtesy of Wilson, Watts did her job keeping the advantage on the field. "I wanted to make sure I was maintaining a good speed, not doing too much in the beginning and have a strong finish," Watts said. She did just that and came home with the team's third consecutive 2:16 split, taking the lead all the way out to eight seconds for NG with one leg to go. Townsend noted Watts just missed out on qualifying for the Emerging Elite 800 meter field the night before. "She was angry and had something to prove," he said. The baton was last in the hands of Hickson, whose job was simple: hold on. 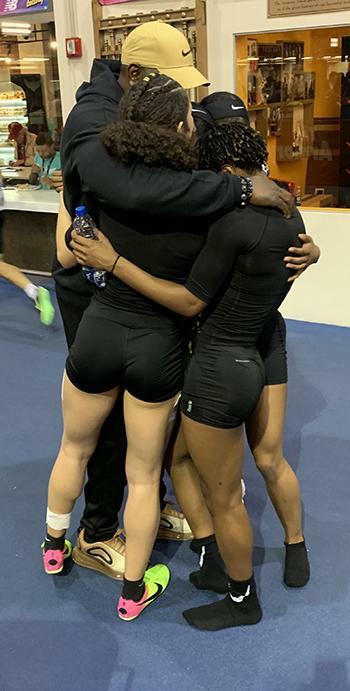 "When I got the baton, the first thing that thing that went through my mind was 'do not lose this lead' because I didn't want to negate all the hard work that these three ladies did," Hickson said. It was all about maintaining for Hickson. 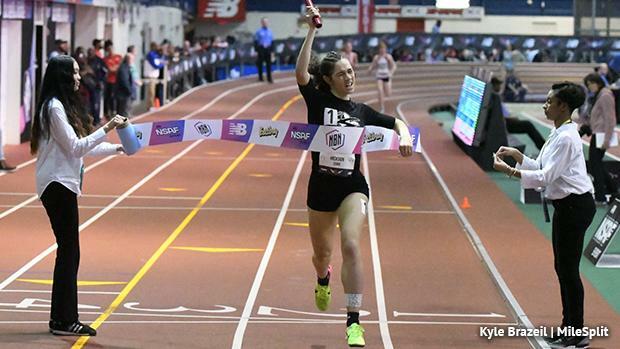 Teams like Ursuline, with Lily Flynn on the anchor, Worthington (OH), Portsmouth (RI), the two-time defending meet champion Ridge (NJ) and the Millrose champs Union Catholic (NJ) were looking to run her down. Ultimately, it wasn't going to happen: "(My teammates) made my job so easy. I felt like I wasn't even running that hard," Hickson said of bringing home the national title with a strong 2:11 split. For Hickson, it's been a long road from December to where she is now. "Kami started off the season running 2:32," Townsend said. "She had an upper respiratory infection and an ear infection." Slowly but surely the junior got healthy and worked her way back, eventually anchoring NG's state championship 4x8 and taking third in the open 800 at indoor states. 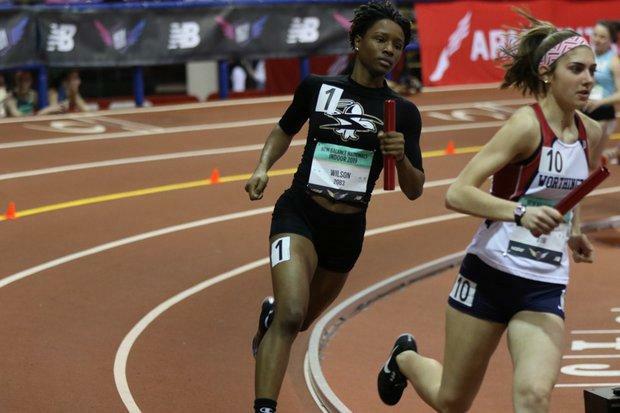 The morning after Saturday's 4x8, Hickson returned to the Armory to run a 2:08.58 in the Championship Girls 800 meters. That was the fastest 800 time by a PA girl from the entire indoor season. There was also the added pressure of being the defending outdoor national champions in the 4x800-meter relay. The NG quartet was well aware. "We knew we had a target on our backs," Hickson said. "We come into practice knowing that. We come into these meets knowing that. But knowing that we have a target on our backs makes us work ten times harder." "I knew we had a title to uphold, so we just wanted to win our first indoor national (title)," Perry said. That team from outdoors, however, is not quite the same. Sydni Townsend, Coach Lincoln's daughter, was apart of that team outdoors, but she's now at the University of Pittsburgh. Watts, a transfer from Agnes Irwin, took Townsend's place on the relay. "I had big shoes to fill, so I came in ready to work hard to do it for them," Watts said. "She brought eagerness and enthusiasm," Coach Townsend added. Her big 2:16 split on the crucial third leg was exactly what the team needed. The next day at NBNI, it was almost a double title for Neumann Goretti. In a thrilling Championship 4x400, NG took second, just .04 off the champions from Western Branch (VA). Regardless, the indoor PA state champs from Neumann Goretti proved they continue to be a force on the national stage. Townsend's giving his girls a week off before it's back to work for the outdoor season. Surely, return trips to the Penn Relays and the top of the podium at the PIAA State Championships and New Balance Nationals Outdoor will be on their minds. "9:02 is a good start time going into outdoor," Hickson said. "Hopefully by the end of outdoor we can go sub-9 again." Perhaps she's underselling it a bit. A year ago, the Saints went 8:53.19 to win the national title outdoors. Maybe even the all-time Pennsylvania state record of 8:51.49 is in the cards for this spring.